We are pleased to announce that our application for a contemporary two storey rear extension at 6 Ranelagh Road, Winchester has been submitted to planning. 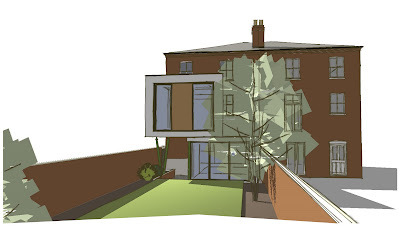 The proposed works will give the house a direct relationship with the garden which it does not currently enjoy and provide a fourth bedroom appropriate to the size of the house and needs of the family. This entry was posted on Wednesday, February 3rd, 2010 at 4:26 pm and is filed under Conservation, Extensions, Planning. You can follow any responses to this entry through the RSS 2.0 feed. Both comments and pings are currently closed.